Following the impact of this week surge in volatility, ETHUSD broke out of its trading range and resume an upward trend. Instead, ETHBTC continues on the long downward move after seeing a strong break-down. Meanwhile, both markets are currently in the middle of consolidation as the next move is yet unknown. However, Ethereum market gained 20% in the course of the weekly trading. 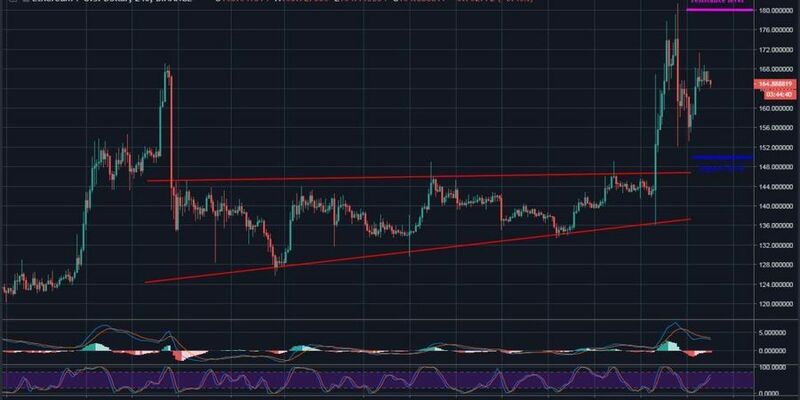 After a massive sell-off, Ethereum has been trading within the range of a rising triangle for the past one month. 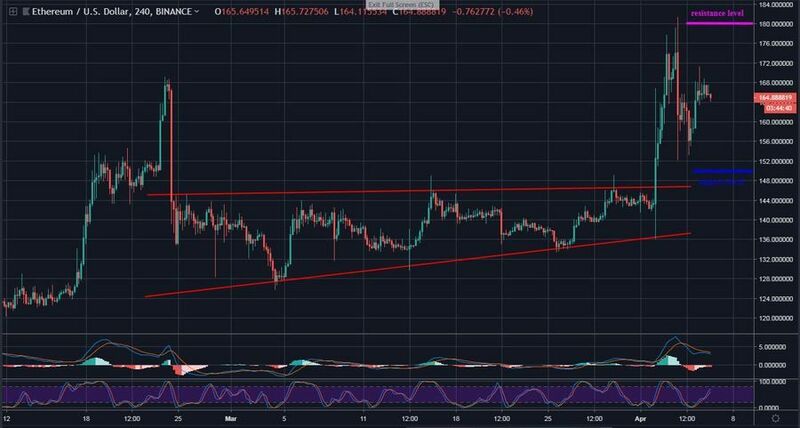 Earlier this week, ETH encountered a price break with a surge in volatility which set the price at $181 before declining to $152 before a bounce up. The market is currently in the middle of consolidation, and trading at $165 price level. A view on the 4-hours MACD indicates that the token maintains a bullish trend. While consolidating, a play out is expected for Ethereum market. A long move is likely to hit $180 resistance level. Surpassing this level, ETHUSD could create a new monthly high at $190 and $200. Also, a short move is expected to locate close support levels at $156, $148 and $140. The 4-hours Stochastic RSI aims the overbought level; signaling an ongoing buying pressure. Considering the Tuesday surge, a bullish formation was confirmed for Ethereum. Since early March, ETHBTC has been on a steady fall due to bears’ control in the market with subdued price. 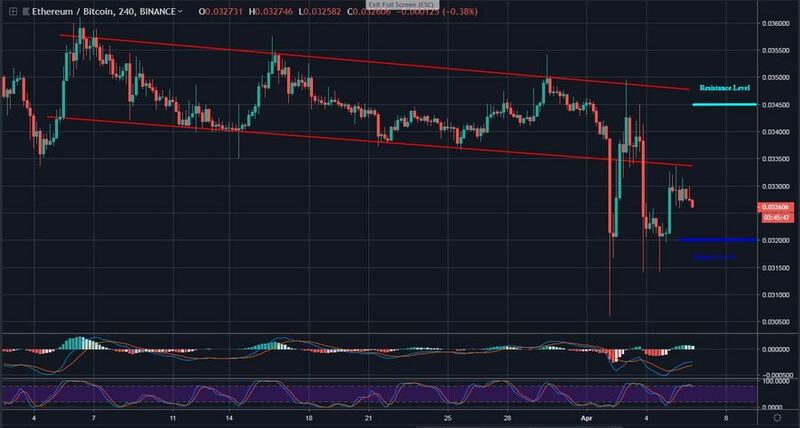 On Tuesday, the descending channel witnessed a break-down as price nears 0.0305 BTC low before establishing strong support at 0.032 BTC. After a retest at the break level, the market remains in the middle of consolidation and trading stabilizes at around 0.033 BTC price level. However, the surge in volatility was significant in the negative zone of the 4-hours MACD. Looking at the current 4-hours Stochastic RSI suggests trading at the overbought area. A bearish move is likely to revisit the last monthly low at 0.032 BTC level. There, the drop could further price to $0.0305 and beyond. On the other hand, a bullish move could hit 0.0345 BTC resistance, near the upper channel. A breach up may set ETH on a bull-run. Ethereum still maintains a downtrend for now.